Veya kitabı 20400 Kobo Super Points ile alın! 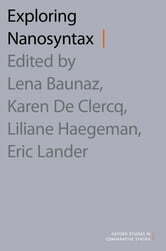 Exploring Nanosyntax provides the first in-depth introduction to the framework of nanosyntax, which originated in the early 2000s as a formal theory of language within Principles and Parameters framework. Deploying a radical implementation of the cartographic "one feature - one head" maxim, the framework provides a fine-grained decomposition of morphosyntactic structure, laying bare the building blocks of the universal functional sequence. This volume makes three contributions: First, it presents the framework's constitutive tools and principles, and explains how nanosyntax relates to cartography and to Distributed Morphology. Second, it illustrates how nanosyntactic tools and principles can be applied to a range of empirical domains of natural language. In doing so, the volume provides a range of detailed crosslinguistic investigations which uncover novel empirical data and which contribute to a better understanding of the functional sequence. Third, specific problems are raised and discussed and new theoretical strands internal to the nanosyntactic framework are explored. 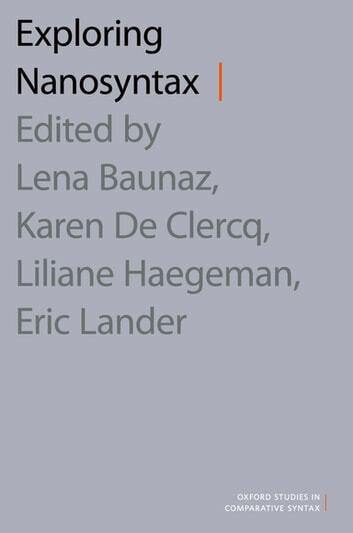 Bringing together original contributions by senior and junior researchers in the field, Exploring Nanosyntax offers the first all-encompassing view of this promising framework, making its methodology and exciting results accessible to a wide audience.